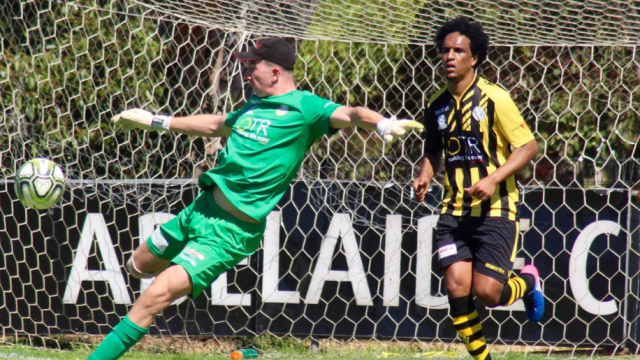 Birkalla fell to Campbelltown City on Saturday in Round 6 of the National Premier League SA, with the score line 3-0 at full-time. A red card to Captain, JP Cirillo in the 45th minute reduced Birks to 10 men for the second half. Senior Coach, Simon Catanzaro, notes that Campbelltown were impressive but he was pleased with his sides resilience. “Campbelltwon are the best team we have played,” he said. With a third of the season in the bag after the upcoming round, Catanzaro remains confident that there is still plenty to achieve. “It’s quite obvious we are going through a rebuild and it’s going to be tough this season,” he said. “It’s a new squad, a lot of younger players are getting an opportunity to play Senior football, probably before they are ready for it, but what a fantastic experience for them and a great challenge for me and the coaches to coach us out of this current scenario we are in. “A few more experienced players that come into this squad will only benefit the playing group on the park. Travel with the team and enjoy a full day of football on Saturday with the Under 18s on at 11am, Reserves at 1pm and Seniors at 3pm.